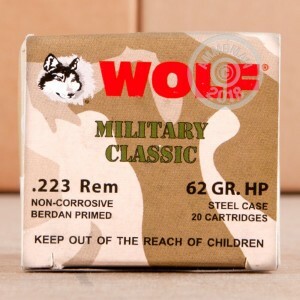 This 500 round case of Wolf ammo in .223 Remington is great for high-volume AR-15 shooting. 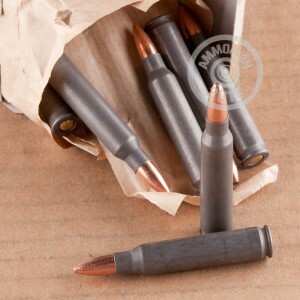 These rounds use a 62 grain bimetal jacketed hollow point bullet and produce ballistics comparable to M855 ball ammo. The non-reloadable steel casings use a polymer coating for smooth feeding and ejection, offering considerable cost savings without reduced functionality. Due to the hollow point of the bullet, these rounds may also serve well in a hunting role. Like other Wolf products, they use non-corrosive Berdan primers that won't force you to clean your firearm immediately after every range session. Not recommended for use with Smith & Wesson M&P 15 rifles. Spend more than $99 in one order at AmmoMan.com to qualify for free shipping. You pay only the list price, with nothing tacked on at checkout.